With the recent near-collapse of our economy, the ways in which we understand and celebrate national holidays seem particularly challenged. This erosion of meaning is just one of many examples of the growing gap between the promise of America–freedom and opportunity through sacrifice and unity–and how people experience Brand America. Like any brand, America will have to close this gap to thrive in the future. Remembering Memorial Day is not about believing in war. It’s an opportunity to reconnect the American Experience with its core promise, and reinvigorate the nation’s signs, symbols, myths, and metaphors with authenticity and relevance. The following is the first in a series of thoughts exploring how design thinking might help do this. 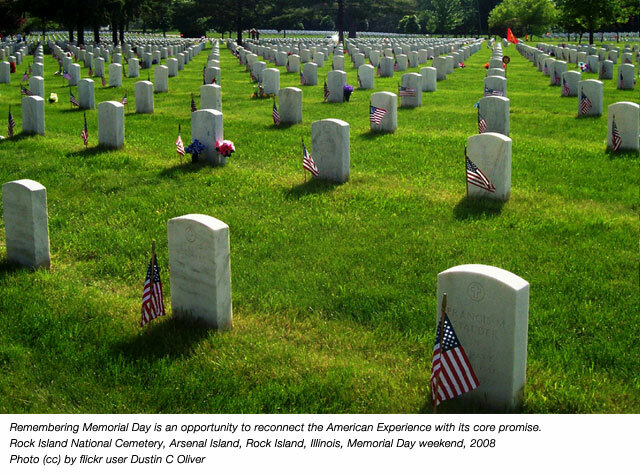 Memorial Day began as a day of remembrance for fallen servicemen, first observed on May 30th, 1868, when flowers were placed on the graves of Union and Confederate soldiers at Arlington National Cemetery. From its inception, this was a solemn occasion. Businesses closed for the day, and towns large and small held parades ending at the local cemetery, where elegies were delivered and prayers offered for the fallen. Citizens tended the graves of the honored dead, decorating them with flowers and flags. For its first hundred years of observance, Memorial Day was both authentic and relevant. Parades made sense back then, because they were effective at connecting with communities. Shutting down cities and businesses was a powerful sign of unity and sacrifice, in recognition of the price a few had paid so others could enjoy freedom and opportunity. 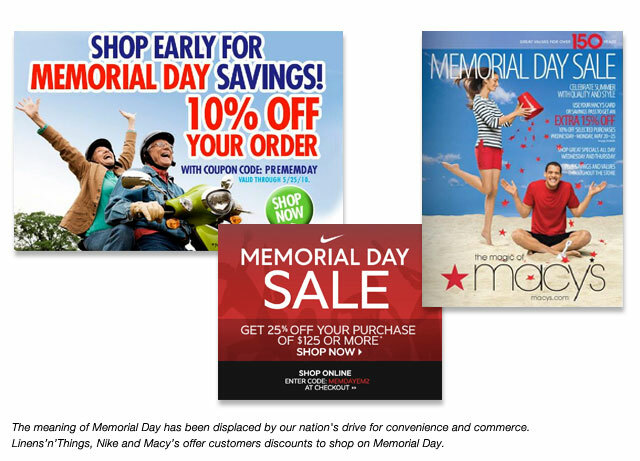 While some exceptional examples of remembrance persevere, for most Americans Memorial Day has become just another long weekend: a mark of summer’s onset, a day when you don’t have to plug the parking meter. If you are in the market for a new mattress or some outdoor furniture, you’ll have plenty of sales to choose from. 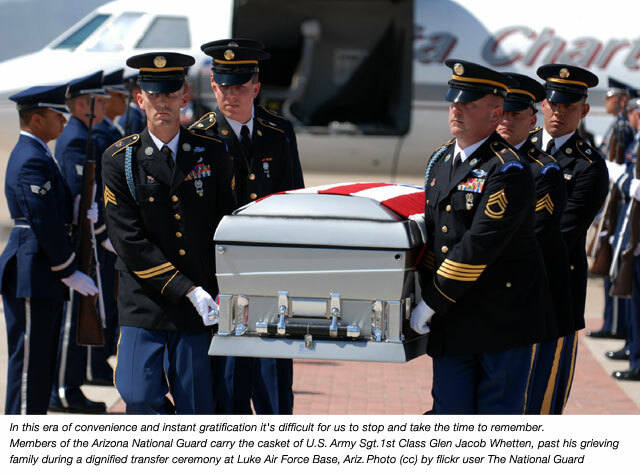 Should you happen to drive by a military cemetery or government building on your way out of town, you might see miniature flags clustered around headstones or flags at half-mast, but little else. In this era of convenience and instant gratification–when mobile screens hold more interest than parades; when regulations are needed to prevent texting while driving; when TV idols are created in the time it takes to sing a song–it’s difficult for any brand to break through the noise and be relevant. For Memorial Day, it’s particularly hard because it requires us to stop and take the time to remember. So what’s the role of unity and sacrifice in a world obsessed with instant gratification? Can we make Memorial Day relevant again? How do we reconnect a new generation to the authentic American promise? In my next couple of posts we will explore specifically how the meaning of Memorial Day was lost and what we can do about it.